The structure and dynamics of the gastrointestinal peptide hormone motilin, consisting of 22 amino acid residues, have been studied in the presence of isotropic q=0.5 phospholipid bicelles. The NMR solution structure of the peptide in acidic bicelle solution was determined from 203 NOE-derived distance constraints and six backbone torsion angle constraints. Dynamic properties for the 13Cα-1H vector in Leu10 were determined for motilin specifically labeled with 13C at this position by analysis of multiple-field relaxation data. The structure reveals an ordered α-helical conformation between Glu9 and Lys20. The N-terminus is also well structured with a turn resembling that of a classical β-turn. The 13C dynamics clearly show that motilin tumbles slowly in solution, with a correlation time characteristic of a large object. It was also found that motilin has a large degree of local flexibility as compared with what has previously been reported in SDS micelles. The results show that motilin interacts with the bicelle, displaying motional properties of a peptide bound to a membrane. In comparison, motilin in neutral bicelles seems less structured and more flexible. 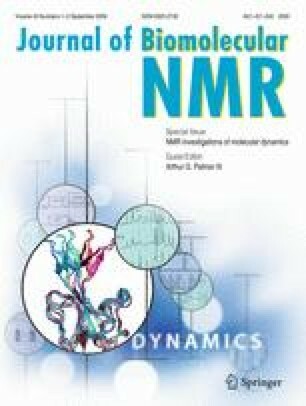 This study shows that the small isotropic bicelles are well suited for use as membrane-mimetic for structural as well as dynamical investigations of membrane-bound peptides by high-resolution NMR.